I love almonds! I love Weleda! 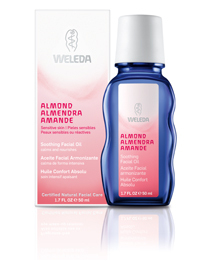 Combine Weleda natural facial care with almonds into a soothing facial oil, and you have made my day! Weleda is a company I have long trusted for their organic, natural beauty products. We were sent a bottle of [amazon_link id=”B003LDMVNM” target=”_blank” ]Weleda Almond Soothing Facial Oil[/amazon_link]. Sensitive skin gets indulgent nurturing with this soothing, hypoallergenic Almond Soothing Facial Oil. Our natural Almond Oil for face is a deeply absorbent, fragrance-free treatment that gently restores your skin’s healthy balance and revives its natural protective functions. I really like using oils on my skin. They have helped to balance my facial skin and leaving it feeling so soft and nourished. Weleda supports biodynamic gardening and the company has strong ethics! If you have read one of my Weleda product reviews before, you know that Weleda is a company a wholly trust and discovered when searching for an effective, natural diaper cream over 12 years ago. Weleda’s soothing almond facial oil is not only organic and effective, but is a beauty product that you can truly trust.